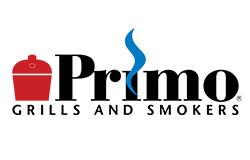 If you’re thinking about owning a ceramic cooker for your backyard barbecues, Primo is a brand that you need to check out. 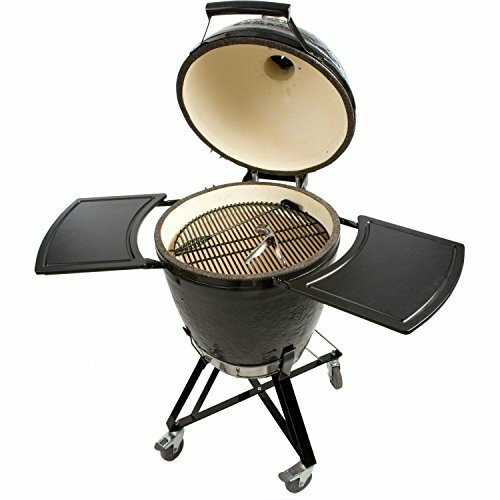 Primo, located in Tucker, Georgia, is a major manufacturer of top quality ceramic grills that are currently sold in more than 24 countries around the globe. These American made grills are all oval-shaped, a patented design that was discovered to be more versatile and efficient compared to the traditional kamado-style grills. 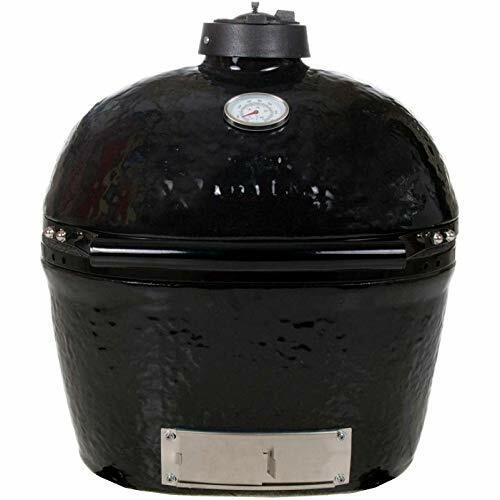 The Primo brand set out to be “the best” and, according to the BBQ experts and grill masters, their oval-shaped grills are the few Kamado-style grills that are truly able to do 2-zone cooking. If you’re going ceramic and you want small, the Primo Oval Junior may be right up your alley. There are loads of things to love about it with just a few things that we don’t like. very versatile. You can cook various types of meat such as steaks, pork, chicken, fish, veggies, turkey, pizza, etc. 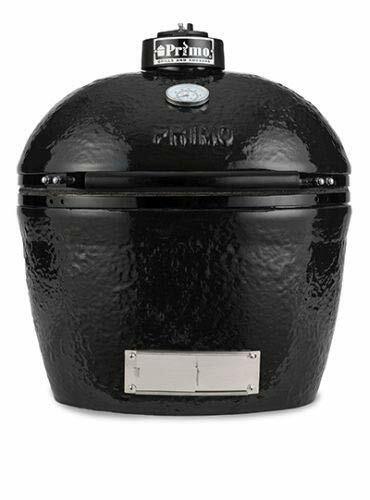 With the Primo Oval Junior, you get a grill and a smoker in one. solid construction, high quality ceramics, and scratch-resistant glaze all ensure that you’ll be enjoying this grill for a long time. reversible cooking grates that allow you to cook the food much closer to the charcoal when you flip the grates over. grates can also be split for true 2-zone cooking: one level can be placed higher above the coals while the other one is placed nearer the coals. What this means is that you can cook using direct AND indirect heat at the same time. while the size is certainly perfect for those who have a small backyard, however, it may be too small for those who love to cook for large parties. The primary cooking surface can only accommodate around 10 burgers at a time. The Primo Oval Junior does cost a lot, especially for beginner backyard chefs. But the investment would be totally worth it if you want a grill and smoker combo for your BBQ needs. If you find the Primo Oval Junior is to little for your BBQ needs, you might want to check out it’s bigger, badder brother – the Primo Oval XL. This is a one-of-a-kind kamado style grill that is quite possibly the most versatile one in its class. enormous grilling space (25″ x 18.5″) coupled with its unique shape ensures that you can lay out several racks of ribs and other BBQ with ease. the versatility of the Primo Oval XL is also due to its reversible grates which allows you to cook closer or farther from the burning charcoal. You can also lower one side while the other side of the grate is remains the same because the grates are split down the middle. With the varying cooking temperatures within the grill, you can grill different kinds of foods at the same time. a firebox divider so you can employ direct and indirect cooking methods at the same time. Primo offers a wide range of accessories to increase your grill’s versatility even more such as extended cooking racks for increased grilling surface. Like any ceramic grill, it’s hard to lower the heat whenever you overshoot your target temp simply because it holds the heat well. The accessories (which you can do without but still….) will definitely up the cost of this grill, which is already very expensive. If you’re looking for a ceramic Kamado-style grill, there’s nothing better than a Primo grill. You get a grill and a smoker all in one. Yes, it does cost more than just buying two grills but the results of your outdoor cooking efforts are going to be priceless. If you’re a bit like Goldilocks and you find that the Oval Junior is too small while the Oval XL is too large, you’ll be glad to know that Primo offers something in the middle – the Oval LG 300. Like the other two Primo grills, the Primo LG 300 has the versatility, the heat, the solid construction, the true 2-zone cooking ability, the reversible cooking grates, etc. Same features and capabilities, different size. It’s still the same superior ceramic Kamado-style grill that we know and love. For those who aren’t converts to the oval design, Primo also offers the traditional round Kamado-style grill. This 18.5” grill comes with a cradle stand, an ergonomic handle, a grid lifter, an ash tool, and side shelves. The cooking area is 280 square inches, almost the same as the Primo Oval LG 300. Basically, you get the complete grilling package; the only thing you’ll be lacking is the charcoal and the meat. You can be sure that this grill is solidly constructed using only the best ceramics available. With all the additional features added, this is a bargain for any outdoor chef. The only downside to this package is the round shape of the grill. We’ve already established how versatile the oval-shaped grills are so going back to the traditional round shape is a bit disappointing. But if your backyard barbecues are more about steaks, burgers, chicken, and pizzas, then this is definitely a good choice. For those who love slow cooking ribs and briskets (which fit perfectly on an oval-shaped grill), this might not be the right grill for you.